Last night at Radisson BLU, as the very welcome but rather unexpected sun streamed in the windows of the Megalithic Foyer, you could almost touch the excitement and anticipation of all those entrants nominated for awards. 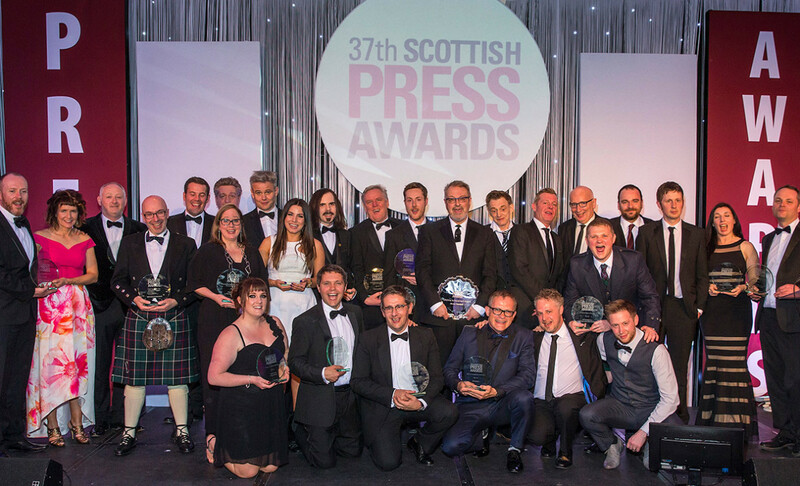 The hotel was positively buzzing and the scene was set for another magnificent event to honour the best that the Scottish press industry has to offer. With 330 guests in attendance, it was a typically fine turn-out and the Champagne reception ensured that everyone was in high spirits as TV and radio personality Tam Cowan settled into his regular role as host of the award ceremony, adding a liberal helping of wit and charm to the proceedings. Assisted by Austin Lafferty and our own Robyn-Nikki Smith as the glamorous onstage assistant, Tam soon had the room cheering enthusiastically as journalists, editors and photographers collected their well-deserved awards. Team ECS, as always, worked away efficiently in the background, ensuring that all the meticulous planning of the last few months came seamlessly together and that the night went without a hitch and also with our trademark touch of (apparently!) effortless style. The ceremony concluded with three prestigious awards – Lifetime Achievement for Bruce Waddell, the former Daily Record editor, whose heartfelt speech, thanking his inspirational father, the former editor of The Falkirk Herald, had more than a few of us reaching for our hankies; Journalist of the Year for a stunned and delighted Mark MacAskill of The Sunday Times; and Newspaper of the Year to The Daily Record, collected by Murray Foote, Editor. A fantastic night for the industry and a feather in the cap for the team from ECS – as always, proud and delighted to be involved in such a prestigious and celebratory event.